For those of you unfamiliar with MLB.TV, its a subscription service that allows users to watch live (& archived) out-of-market games on their computers via the internet. Assuming you have decent internet bandwidth, you’ll get every game in 720p HD. You can also port your MLB.TV subscription to watch through other devices like iPad, iPhone, Roku, PS3, Apple TV, and Android phones. (Update 4/18/2011 – If you are interested in MLB.tv in conjuncture with any TV connected devices, please see the “Overview” at the end of the post. ) Some of these devices such as the iPad, iPhone, and Android require the separate purchase of MLB.com At Bat 11 app. We’ll be taking a closer look a some of these devices in separate reviews. 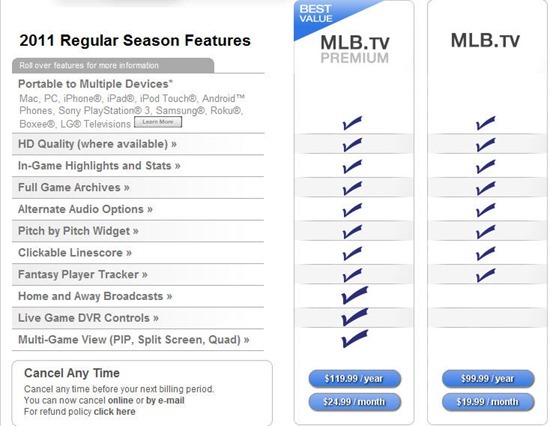 UPDATE (6/30/2011): Prices for MLB.tv have been reduced to $59.99 for Standard (Basic) and $79.99 for Premium package. There are two different subscriptions available, Basic and Premium. Basic is $99.95 for the entire year or $19.99 / month and Premium is 119.95 for the year or $24.99 per month. The big differences between Basic and Premium is that with the Premium, you’ll get the DVR type controls, Multi-game view, and the ability to choose which team’s announcer’s to listen to with the broadcast. Log onto the MLB.com Media Center to find the days available games. Both MLB.TV Subscriptions come with Gameday Audio, so if you’d prefer to just listen to the game you also have that option. Note: You’ll notice some games aren’t available in the image below. This is because it’s spring training and not every Spring Training game is available. 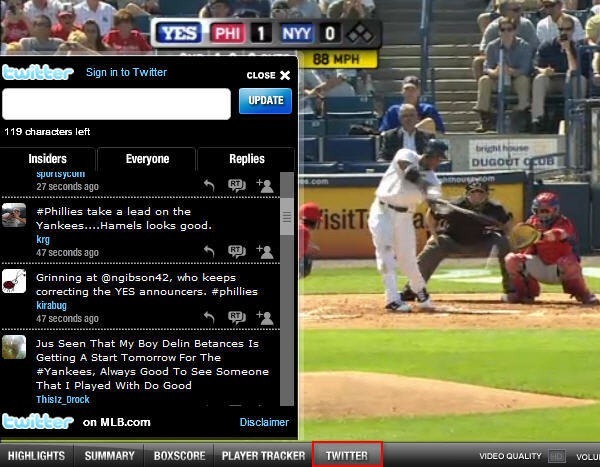 …and the MLB.TV viewer will pop up in a separate window. The window is about 800 x 600 pixels with a viewing area of about 800 x 450. You can switch to full screen or “mini view” which gives you a 400 x 300 window. One small complaint we had is that you can’t customize the size of the viewing window. If you try to drag the corners of the window to increase the size, the window size increases but the viewing area stays the same. A minor issue for most, but for those with limited screen area that want to multitask on their computer while watching, re-sizing the viewing area to a custom size would be a nice feature. When you hover your cursor over the lower part of the viewing area, some DVR-style screen controls will be displayed. These options will only work for the Premium subscribers. When you click on “Watching,” any additional broadcast options will be displayed. These features are mainly for Premium subscribers, but in some cases, like the one shown below, you have the option to listening to the Yankees TV broadcasters (YES) or Audio (WCBS) to accompany the video. Only Premium subscribers can choose to listen to home or away broadcasters. Commercials? There are none. During commercial breaks, you get pleasant silence along with a graphic like the one below that displays the score and inning. Click on “Summary” at the bottom to get play-by-play recap of each batter, plus any pitching and position changes. 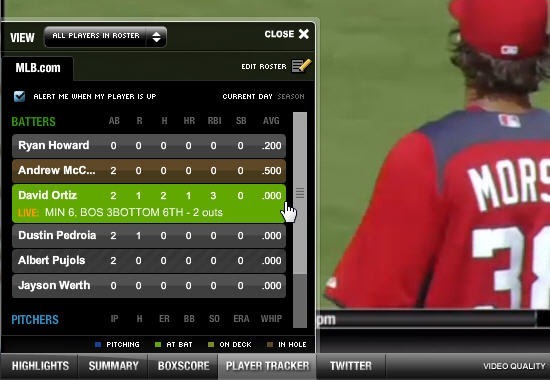 Click the inning number along the top to jump to that inning’s summary. There is also a built-in Twitter client. Follow tweets about the game or login with your Twitter credentials join the conversation. 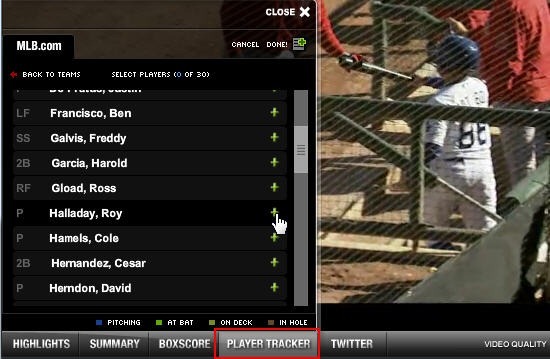 Player Tracker is a cool feature likely to appeal to any fantasy baseball players. You can add members of your fantasy team, or just favorite players, to the Player Tracker by navigating to the players team, and clicking the (+) next to their name. When those players make a plate appearance or enter the game, you’ll get a notification message pop-up at the lower left of the screen. Plus, you can track players daily stat line. Color codes tell you whether a player is up, on deck, or in the hole. Click on Today’s Games or Archive to check scores or to jump to video of another game. There is the standard Single View, Single View with Picture in Picture, Split View (2 games at once) and Mosaic View (4 games at once). The Basic package only gets the single view while Premium has access to all 4 views. We initially noticed during pre-season that while some games looked great, a couple of games have had less than stellar video quality. 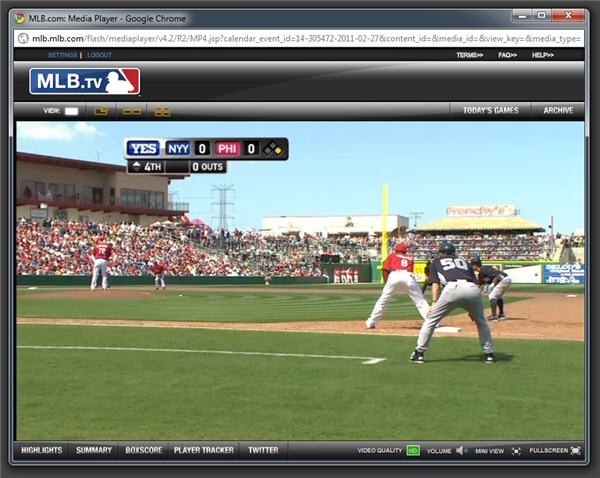 MLB.TV explained via a screen pop-up when you log on that most spring training ball parks broadcast in standard def and all games will be in 720p once the regular season starts. Approximately 90 minutes after a game is completed it will be archived and available for on demand viewing. Archived games have no blackout restrictions. You can access Archived games from the MLB.com Gamecenter where they will be designated with an “A” icon next to the game. You can also use previous day or calendar links to navigate to archived games throughout the season. … or from within the Video player itself. 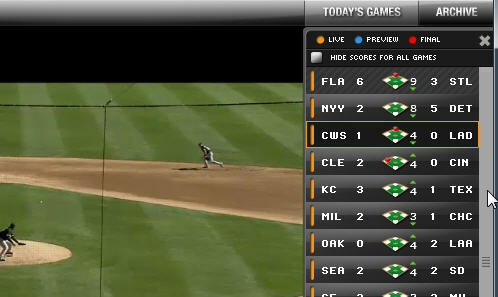 Ok, the blackout rules are far and away the biggest drawback to MLB.TV. I don’t want to veer off into too much of a rant, but these blackout restrictions can be pretty ridiculous in certain areas. If you are thinking of buying MLB.TV to watch certain teams, you really need to check out the MLB.TV blackout restrictions and see which team’s games are blacked out in your region. Don’t assume that just because you live a few hundred miles away from a city that you won’t be blacked out. Pittsburgh is one of 4 teams blacked out in my area even though it is about 250 miles away and they aren’t broadcast on TV where I live. From what I’ve heard, Blue Jays games are blacked out EVERYWHERE in Canada. You should also know that black outs are determined by your IP Address, not your zip code. You can find out who is blacked in your area out here on mlb.com. 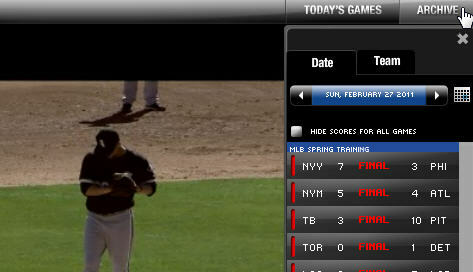 There are no blackouts during Spring Training, but not every game is available. Also, you should note that all post-season games are blacked out in the U.S & territories. 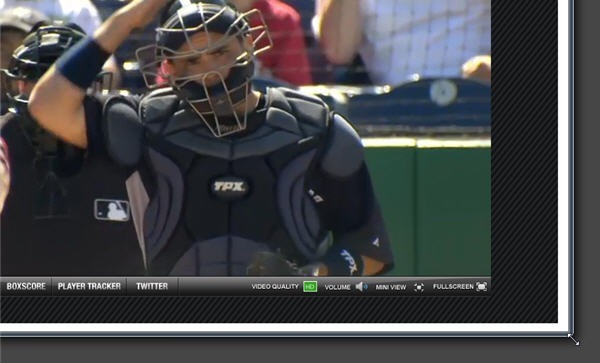 Blackouts aside, our experience with MLB.TV so far has been excellent. There no question that the die hard baseball fan or fan of an out-of-market team will love MLB.TV. Sure, no blackouts would be ideal, but that isn’t an option and we knew that going into it. 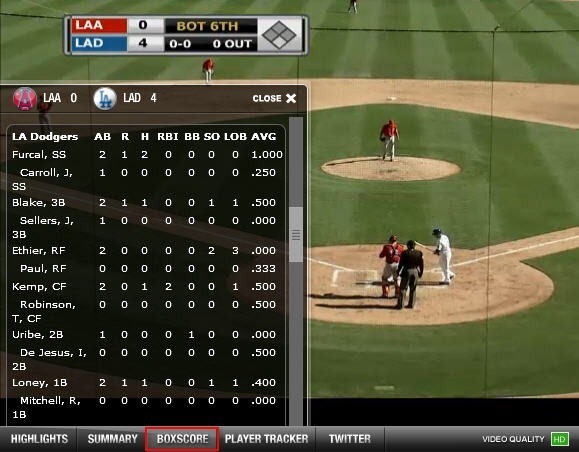 The video quality and features are quite good and as a fantasy baseball guy, I love being able to track my players at-bats and statistics right in the video player. 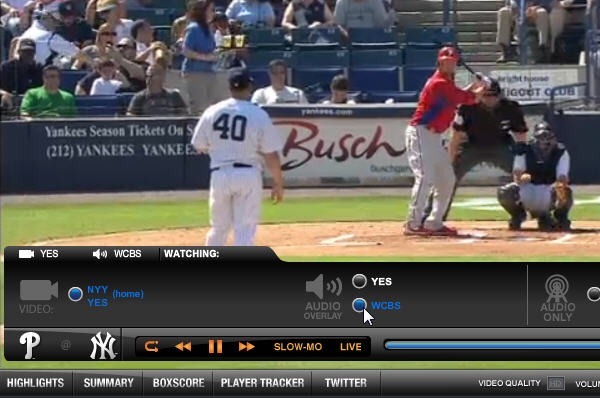 Also worth noting is that you can also listen to every game live online with a subscription to MLB.TV. There are no blackout restrictions with the radio broadcasts. We’ve heard that MLB.TV traditionally has a lot of issues at the start of regular season that seem to get sorted out within the first week. So far this spring we’ve had all positive experiences. We plan on updating this post as needed as we get into the regular season, so we’ll bring any pertinent updates as we experience more of MLB.TV. Update 4/18/2011 – Please note our review of MLB.tv covers watching the games on computer, not any TV connected devices like PS3, Roku, etc. If you are considering purchasing MLB.tv for use with external devices, please consult the MLB.tv support forums before you purchase. (You’ll need to create a MLB.com username & password) There are currently an overwhelming amount of issues with these devices. MLB.tv claims they are working on the issues, but as of this update, they offer no ETA. 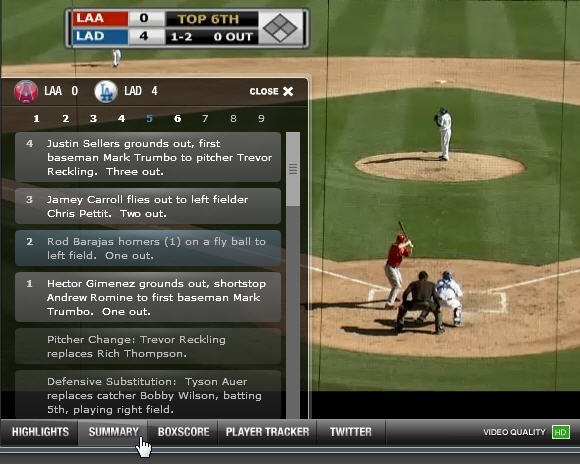 Watch MLB online – Click here to Sign up for MLB.tv!